We recommend that you set your files to 644 and your folders to 755. If you are using a PHP script or application, you should never set your files or folders to 777. 1. Login via FTP and use your FTP client to CHMOD your files. 2. 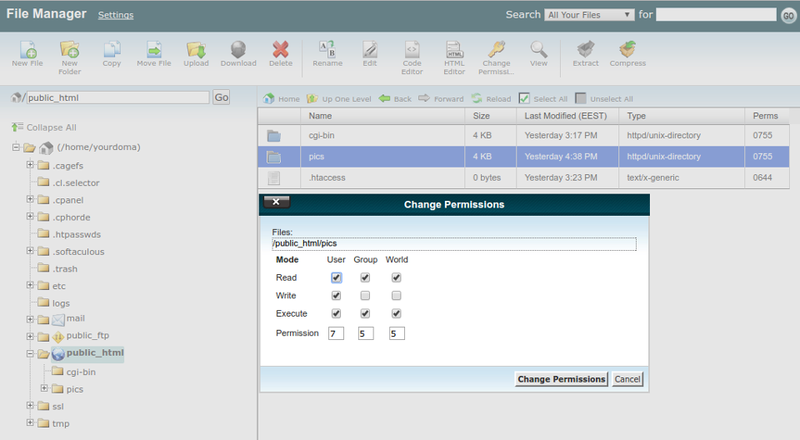 You can change file permissions in the cPanel file manager. 3. You can do this from the server using SSH. CHMOD is the command that changes the permissions of a file. NOTE: cPanel Launch doesn't support access over SSH! Others have read and execute permissions. Get secure web hosting with included SSL certificates at no additional cost.